You really need to spay and neuter your GSD if you haven't already. If your female dog is spayed before her first heat cycle she will have almost a zero chance of developing breast cancer later in life! Concerning male dogs, the process of neutering helps to prevent prostate enlargement as well as cancer down the road as your dog matures. It also often cuts down on the need to wander by many male dogs and many other territorial behaviors. But first, it is important to understand exactly what happens whenever you spay or neuter your German Shepherd puppy and what to expect during the process. What happens when you spay your female German Shepherd? Both ovaries and the uterus are removed while the pet is under anesthesia. Postoperative care must be followed carefully to avoid the occurrence of nasty infections. What happens when you neuter your male GSD? Basically, the dogs testicles are removed in a surgical manner while the pet is under anesthesia. The wound needs to be thoroughly dressed and cleaned after surgery. Spaying or Neutering Your GSD is a Good Thing - Really! • Spaying and neutering can reduce many health problems. • Spayed or neutered pets often live longer, healthier lives. • Spayed or neutered dogs do not necessarily get fat or lazy. • Spayed or neutered pets are often more affectionate companions. • Spaying your female German Shepherd eliminates the possibility of uterine or ovarian cancer and greatly reduces the possibility of breast cancer. • Neutering your male GSD eliminates the possibility of testicular cancer and lowers the incidence of prostate problems. Having your pet spayed or neutered is a very important part of responsible pet ownership. This one process, to spay and neuter your GSD, greatly increases the lifespan of your dog! 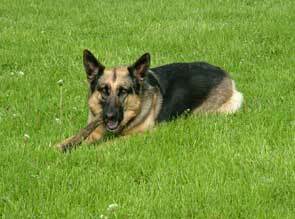 Speak with your veterinarian about spaying or neutering your German Shepherd today if you haven't done so already.